Compare prices on car hire in Örebro from all the major brands and find the best deals. When you book through us, unlimited mileage and insurance are always included in the price given. Örebro (approx. 100,000 inhabitants) lies in Narke, about halfway between Stockholm and the border with Norway – the river Svartån which flows into the lake Hjälmaren.The city is the administrative center in Örebro län. Örebro’s old town, with roots back to the 1200s. It grew up around a medieval castle on an island in Svartån. 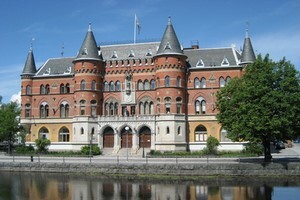 The castle was built around 1600 into a castle in Renaissance style, which today is Örebro’s foremost tourist attraction. Other architectural attractions include Sankt Nicolai kyrka (1200-/1300-tallet), Nicolai församlingshem (where the oldest parts are from the 1300s), Arbetshuset (1740s) and the residential quarter century Centralpalatset Art Nouveau (1912-13). Örebro is also known for its many large shopping centers – including Complete Assen, KRÄMARE, Träffpunkt and Oscar C, all located in the center – and Marie Berg Galleria approx. 9 km south of the city. Airport Orebro Airport is approx. 12 km west of downtown.